Fergus was caught by spiders and almost became their lunch. But he's not giving up! Even being completely wrapped up in a web, our hero doesn't lose courage, and continues moving, hanging on for his dear life! Fergus isn't the only one strayed in these gloomy rooms: a couple fireflies also couldn't find an exit. 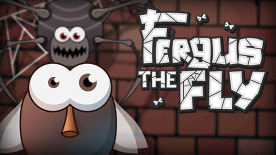 Help Fergus pass all tests, save the fireflies and find a way out. In this game you'll have a long and hard journey through the abandoned house, filled with danger. You'll have to guide the brave fly past the ingenious traps, outsmart the enemies and save those poor fireflies.